The Economics Department at The New School for Social Research is one of a small number of economics PhD-granting programs in the world that offer rigorous, high-quality training for young scholars that emphasizes the history of economics, political economy, and economic history, and includes Keynesian, Post-Keynesian, Marxist, structuralist, and other heterodox approaches in conjunction with a critical and informed education in mainstream neoclassical economics. The Economics Department remains committed to upholding and continuing this tradition. Widely respected for its academic rigor, The Department of Economics fosters a broad and critical approach that covers a wide range of schools of thought: Keynesian and post-Keynesian economics; the classical political economy of Smith, Ricardo, and Marx; structuralist and institutionalist approaches to economics; and neoclassical economics. The philosophy of the Department sees political economic insight as growing out of an informed understanding of the history of economics and economic history, shaped through the application of cutting-edge analytical theoretical and empirical research tools. The range of student and faculty work is reflected in the Department's working papers, posted to RePEc. Courses of study emphasize the historical roots of economic ideas, their application to contemporary policy debates, and conflicting explanations and interpretations of economic phenomena. We emphasize research within the context of a rigorous training in conceptual, mathematical, and statistical modeling techniques that form the methodological basis of contemporary economic research. Our work centers on the changing shape of the world economy, its financial markets and institutions, problems of regulating and guiding economic development in the advanced industrial world and in emerging markets, complexity in economic systems, labor markets, and the economic aspects of class, gender, and ethnic divisions. 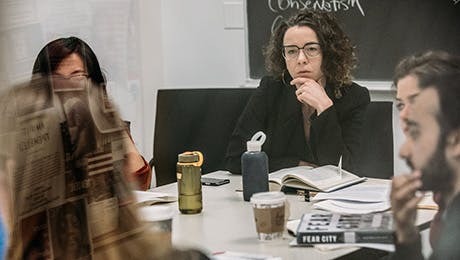 Together, faculty and students regularly participate in the research activities of The New School's vibrant interdisciplinary institutes and centers, like the Heilbroner Center for Capitalism Studies. The Economics Department houses the Schwartz Center for Economic Policy Analysis (SCEPA), to which economics faculty and students also contribute. Our aim is an informed, critical, and passionate investigation of the economic foundations of contemporary society. An engagement with the central unresolved dilemmas of modern society motivates the detailed analysis of concrete problems of economic policy and the explanations of economic phenomena that are the substance of our department's degree programs. The Department of Economics offers MA, MS, and PhD degrees in Economics and an MA in Global Political Economy and Finance. Students who complete MA and MS requirements with sufficient distinction may be considered for admission to PhD study. The department also grants direct PhD admission to well-qualified applicants who have completed a comparable MA in Economics at another institution. New School graduate students in other disciplines may also complete a graduate minor in Methods and Concepts of Political Economy. Renowned, imaginative, and ground-breaking - meet some of our faculty. Economics is a discipline that combines abstract thought with concrete empirical observation. Courses provide different points of view on both the historical context and modern importance of different schools of economic thought. Ebba Boye and Ingrid Kvangraven want to widen the lens through which we examine economies.